I have been very busy prepping all of the supplies for this weekend's Stamp a Stack. I love Stamp a Stacks, and I know my customers do too. You may not know what a Stamp a Stack is. A Stamp A Stack, or SAS, is an afternoon where you pay a set fee and get to make a stack of cards. I normally do 5 different designs and you get to make 2 of each design. This will vary on the type of class and the level of detail on the cards. For example, I do a 20 card SAS for Christmas because that is when we need lots of cards! If I am doing cards that are very technique heavy or use lots of supplies, you may only have 4 designs. Each SAS is different but I base them on themes....birthdays, holidays, all occasion, or in the case of this week: Brides and Babies. 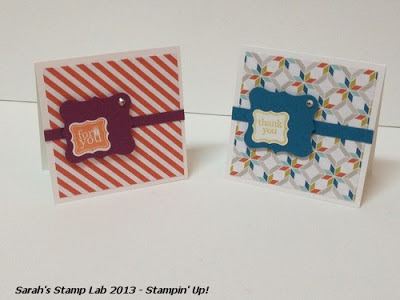 Stamp a Stacks are good for stampers with some experience as you work independently at your own pace. If you have taken 1-2 of my card making classes, you will be fine at a SAS! Now on to today's cards. I was playing around with the new Petite Curly Label punch and started making a cute little 3"x3" notecard set. I really love this punch and the Sycamore Street Designer Series Paper. I think the color comination is so fantastic! Today I have two of the note cards and on Friday I will post the last two. Reminder: March is just around the corner and that means that a brand new Best of Stamp set will be released. Stay tuned!